Hi. I am an MA student in History of Design at the Royal College of Art and V&A museum. I am currently doing an object research project on a breastplate and pair of tassets, thought to be of German origin from around 1620. I have learnt so much from reading your forums and wondered if any body can help me with my research. I am particularly interested in why this armour is thought to be german and what type of person would have worn it. 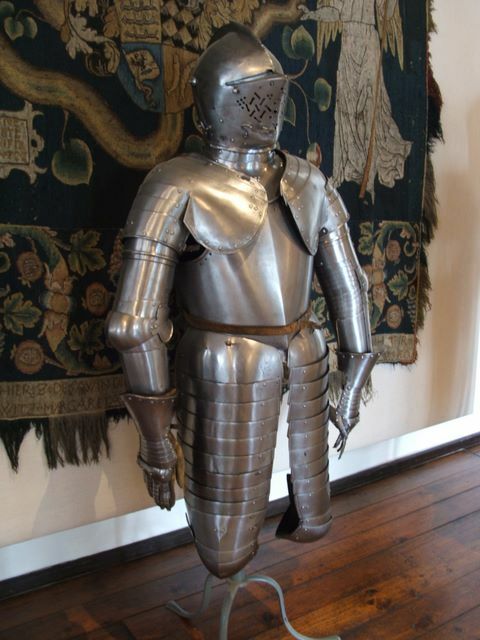 I have read the discussions on munitions armour and am not sure where this armour fits into that. The decoration is painted and quite crude...perhaps this was applied later. Any help or tips would be really appreciated. looks like cuisse to me. The style fits the time fine. Usually there is a mark or pattern that gives an idea as to where it originates. For some time late 16th and 17th century helmets were said to be from a certain place by the decoration but I am not sure that really is being supported by modern research. Any idea if there are marks on it? Inside would likely be where they are al. That looks like cuirassier armour, worn by the most heavily armoured cavalry of the time. The gussets on the breastplate's arm openings are unusual at this time; I've not seen before any this late, and often at this time old breastplates with such gussets had them removed in order to 'modernize' them a little. It can be quite difficult to identify what region various parts come from; helms and helmets are the easiest. I suspect the gussets are a strong clue. 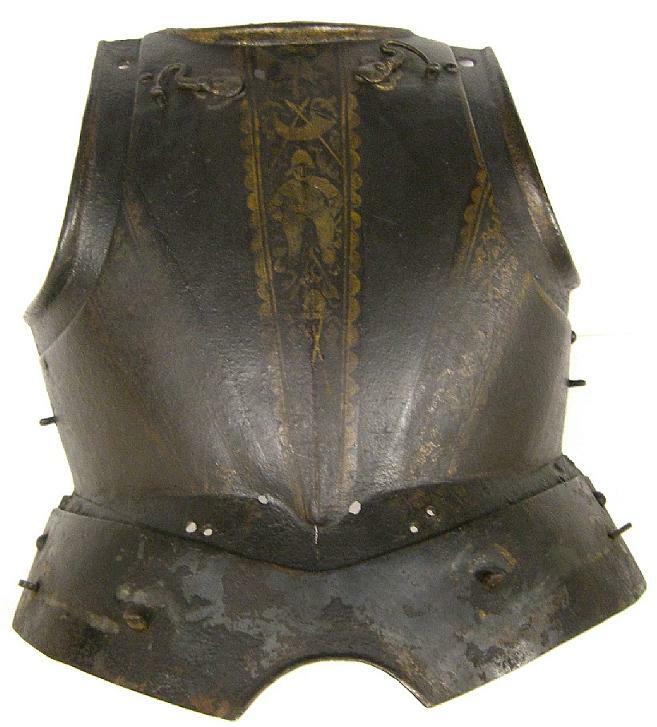 I attach a picture of a cuirassier armour from Veste Coburg for comparison. It does not have the gussets. I've just noticed that it looks as though the lowest lame of the fauld has been slapped on over a preexisting lowest lame in order to make the legs fit. Is this so? Or is the lame I seem to see just an engraved line? - I have managed to handle the breastplate and there aren't any marks on it. I'm not completely sure why not. Is that because it is munitions armour or because it is made from iron and not steel or something like that? - i don't think the lame has been put on at a later date..i does look much smoother in real life and from looking at the inside this does not seem to be the case. I was wondering if people thought this was munitions armour? i had the idea that the painted decoration, which is quite crude would have been added at a different date when the armour would have been used by a specific person....is there any currency in this idea? Does anybody have any ideas on the decoration? i am at a loss over what it means. Thanks so much for your help! it is so much appreciated! Armour was often stamped with a mark for the town or guild which made it, like a modern brand insignia or "Made in Canada". Different makers had different reputations for quality. Of course, sometimes unscrupulous armourers put someone else's mark on their products (or put their mark on someone else's cheap products) so buyers would think it was better than it was. Let me repeat that the armhole gussets are the most unusual feature of this armour, and are your best bet for narrowing things down. The embossed 'stars' on the poleyns remind me of Brunswick stuff, and might be a main reason for the German attribution. Much more armour was originally painted than modern specimens would seem to suggest, as it tended to be cleaned off. The painted decoration on this armour, when new, would have been reasonably convincing at a distance of appearing to be etched and gilt. This would seem to me, though, to be a bit odd, as earlier Brunswick armour (if my sense about it is correct) in particular, was very rarely gilt. I suggest you apply to armsandarmourforum.com, as the people who frequent that site are much more concerned with armour than this one, which is more concerned with weapons. My own knowledge of armour after 1600 is a bit foggy.